Producers of cookies and biscuits face many challenges processing and packaging their products in plastic containers. With a growing market, manufacturers must increase their production line speed to match those of over 300 packages per minute and downstream equipment should be able to work efficiently at this speed, as well as any other inspection system on the line. Foreign bodies can contaminate the raw materials of cookies and biscuits during any phase of production. They can arrive already inside the mixture of ingredients or be introduced during the processing phase. Proper portioning is another major concern for cookie and biscuit manufacturers because the packs of biscuits can be underweight, overweight and individual cookies or biscuits can be missing or broken. 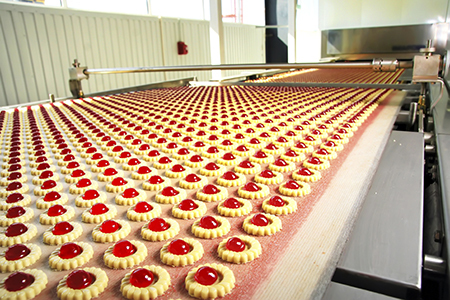 To overcome these issues, conventional methods require cookie and biscuit manufacturers to either install a range of product inspection equipment on their production line – checkweighers, metal detectors, vision systems or just one solution – x-ray inspection. X-ray Inspection Solutions Using x-ray technology as an inspection method eliminates the need for multiple product inspection machines on one production line. X-ray systems can inspect a wide range of foreign bodies such as metal, glass, mineral stone, calcified bone and plastic and rubber compounds, no matter what type of packaging. 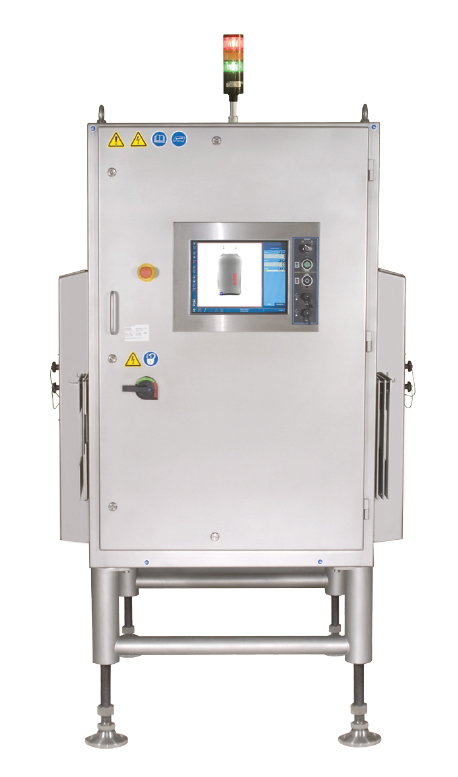 While inspecting cookies and biscuits for contaminants, x-ray systems can also be used as in-line checkweighers and deliver more precise results in comparison to traditional checkweighers which could give inaccurate readings at high speeds. Other inspection routines such as identifying missing biscuits, as well as checking for broken cookies, can also be performed simultaneously at high line speeds. Additionally, the sensitivity of x-ray machines is not affected by freeze/thaw conditions, moisture or salinity. The Eagle™ Tall PRO XS addresses these issues for cookie & biscuit manufacturers. 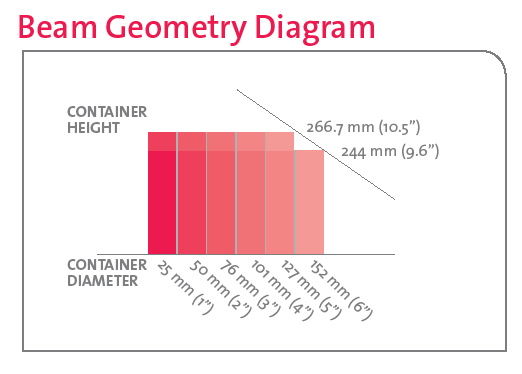 The side view x-ray detection coverage provides full inspection for a range of container sizes and product configurations help maximize production throughput, as well as efficiently utilize valuable floor space. Specifically made for manufacturers that package in upright containers, the Eagle™ Tall PRO XS has multiple inspection capabilities such as contaminant detection, mass measurement, seal inspection and component count. Eagle’s proprietary image analysis software, SimulTask™ PRO, uses advanced algorithms and regional contrasts to provide the most accurate individual package weights in the industry. The high quality images provide enhanced contaminant detection, accurate package inspection and precise total weight for an entire container of cookies or biscuits. Additionally, with SimulTask™ PRO, various products can be dynamically analyzed in real-time for optimum analysis of each type of cookie or biscuit container, reducing the need to stop your line for product change over. 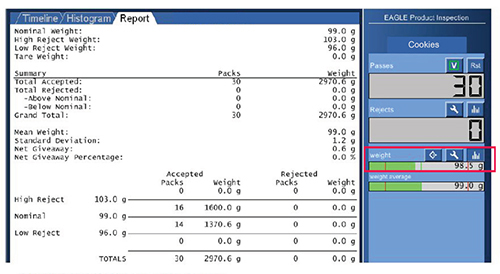 Checkweigh results for cookies packaged in tall plastic containers on the Eagle™ Tall PRO XS demonstrating a 2%-3% sigma score, equaling a 98% level of accuracy.